About a year ago, I had the opportunity to share my journey into medicine through Inside Stories. Now, after finishing my first year of medical school, it was a pleasure to chat with J.J. Bouchard, a Certified Child Life Specialist and Certified Therapeutic Recreation Specialist at C.S. Mott Children’s Hospital, about my experiences helping others. Helping: Conversations with Child Life Specialists and Other Helper Professionals is a podcast that features people who have dedicated their lives to helping others. I was truly honored to participate in this podcast project and to have a chance to reflect on my experiences as a helper and what being a helper means to me. In this podcast, I shared some of my experiences with the Chronicling Childhood Cancer narrative project and the book, as well as the current volunteer work that I’ve become involved in as a medical student. J.J. was instrumental in helping me with my research project (as you’ll hear about if you listen to the podcast! ), and his podcasts provide great insight into the stories of people who devote themselves to helping others. It is incredible to me the variety of ways that people choose to make a difference in the lives of others, and listening to these podcasts has reminded me that there is so much that we can learn from each other. Check out the podcast here, and subscribe to hear more from other helper professionals! Short for infertility, a disease resulting in the abnormal functioning of the male or female reproductive system. There are many causes, some known and many unknown. It is often merely a matter of chance, a condition that arises with little explanation. I have to confess that I had not thought all that much about infertility as an illness until I encountered ART of Infertility, a “an infertility artwork, oral history and portraiture project.” This art exhibit is a compilation of infertility stories expressed through various artistic media, by a diverse range of women who have experienced or are experiencing infertility. I’ve been struggling to write about this exhibit for months now, but nothing I say seems to do it justice. I guess I just want to say that this exhibit moved me in inexplicable ways. The stories that these women share, the art that they use to express their own inexplicable emotions were incredibly powerful. Their words, their symbols, the hues and textures and things were all used to convey the spectrum of ways that infertility touched each of their lives and their selves. The ART of Infertility prompted me to realize just how many potential triggers exist in our society for those who are infertile. As a society, we make so many assumptions about how those who are married will have children (or, side note, even those who are not married, for family planning comes up in many professional development discussions with women in medicine it seems). It reminded me of how intimately femininity is often intertwined with the ability to bear children. While this is not always the case, it’s one thing to make the decision not to have children; it’s another thing all together to not have the ability to make that choice. For those with infertility, the constant reminders of one’s infertility may seem ever-present. Menstruation may be a monthly reminder, a taunt about the body’s reproductive shortcomings. Those struggling with infertility may be surrounded by constant reminders as their peers procreate without problem. There are so many challenges to one’s self that can be inflicted by infertility, challenges that are best told by those who experience it themselves. I guess infertility is another illness that urges me to wonder how we as a society, as strangers, friends, and family to those invisibly suffering, can cultivate a more sensitive environment. Can we open our minds to the variety of ways that people choose to live their lives and the many aspects that may lie outside of their control? Is it possible for us to cultivate a culture of sensitivity that reconciles the course of majorities with the various paths taken by everyone else? How do we escape the limitations of assumptions and make space for human diversity? This is the phrase that first intrigued me about the Third Annual Western Michigan University Medical Humanities Conference‘s Call for Abstracts. I am excited to have the opportunity to present about my thesis research, Chronicling Childhood Cancer: Illuminating the Illness Experience, at this conference one week from today. This is my first conference to attend and present at, and the uncertainty of what to expect is thrilling. The innovative field of Medical Humanities is so interdisciplinary; who will I meet and how should I tailor my presentation accordingly to this diverse audience? What insight can I bring from my experiences in the field, and what do I hope to learn from others? How can I make the most of this incredible opportunity? With funding from the University of Michigan Department of English, it is an honor to be able to attend, engage, and contribute to this conference. Standing before us were four individuals: a public health professor, a director, an actor, an artist. But each of these individuals held so much more than just one profession; they each dabbled into a variety of other realms, but they were all here for one reason. Today, they were here to promote the power of narrative. 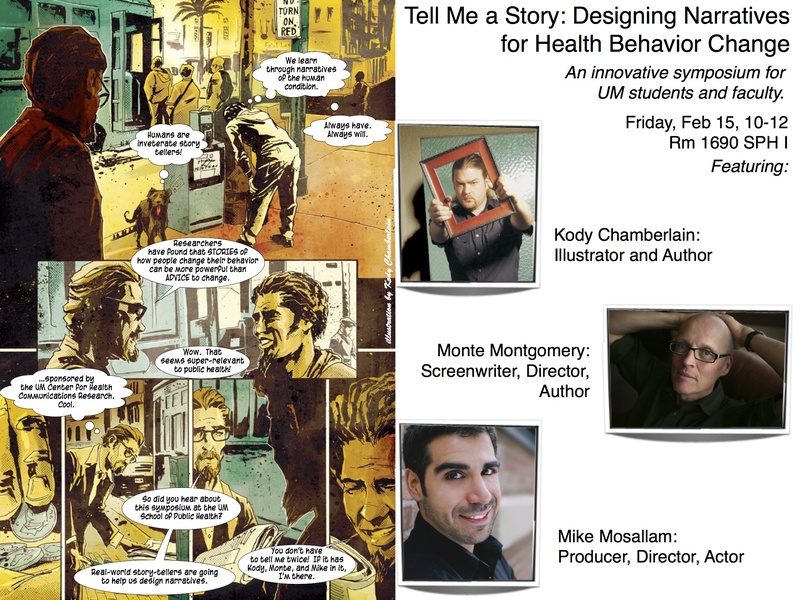 Tell Me A Story: Designing Narratives for Health Behavior Change was an extraordinarily compelling and fascinating symposium organized by the School of Public Health. With three prominent guest speakers each contributing their insight about a different facet of the narrative, this symposium explored essence of the narrative and the potential potency of its role in instigating change. To begin with, Monte Montgomery showed the audience what makes a story. 4 purposes, often accomplished by a 3 act structure. Engaging, understandable, and memorable all lead to the fourth purpose: actionable. The 3 act structure, as illustrated below. Although this 3 act structure seems to be relatively pervasive in our society, I found it interesting that illness narratives represent one of the few genres that often defy this standard. Just as disease pushes against the normal functioning of the body, illness is defined by a deviation from the norm. And since illness narratives are created to mirror the illness experience, illness narratives resists the 3 act structure. So what are the effects of this resistance? The most powerful deviation in my mind was that while 3 act narratives imply that conflict allows for an individual to achieve greater stability. This in many ways embodies the triumph narrative, which Conway so persistently cautioned us about. The 3 act structure suggests that the restitution narrative allows for not only a restoration but a progression, where an individual becomes better off than they were in the past. Illness narratives that break free from the model of the triumphant overcome of illness, then, also escape the confinement of the 3 act structure. After Montgomery had established a basic understanding of narrative and explored the individual change that narratives can inspire, Mike Mosallam discussed the social changes that can arise from narratives. Leading with the powerful question “What is my story?,” Mosallam gave us a glimpse of his own narrative and introduced us to his reality TV show All American Muslim to show how theater can instigate social change by creating dialogue, building bridges, and humanizing groups of people such as Arabs/Muslims. What do you want to do? How do you want to do it? And how can you incorporate the power of narrative?